Winners will receive notification from PHR regarding Sectionals. Contact Thomas McCauley at tmccauley161@aol.com for more details. As of January 1, 2018, the new USA Baseball Bat Standard was implemented. USABat Standard bats must be used in the Little League Major Baseball Division and below. Little League-approved baseball bats that were approved for use for the 2017 season will no longer be acceptable for use in any Little League game or activity as of January 1, 2018. For more information on the USABat standard and a complete list of bats approved through the USABat Standard, visit usabat.com. 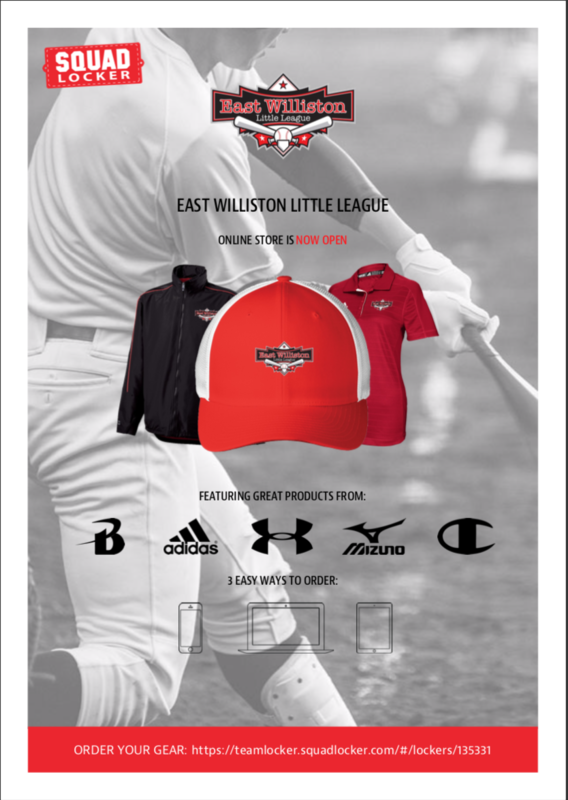 The East Williston Little League apparel partner "Squad Locker" is offering our community 20% off all purchases this weekend. Simply click on the featured image OR visit www.ewlittleleague.com to purchase. ENTER CODE: HAPPYNEWGEAR This offer expires Sunday at midnight..
1) USE OF BATTING CAGE IS ON A FIRST COME, FIRST SERVE BASIS. IF PEOPLE ARE WAITING TO USE THE CAGE, USE IS LIMITED TO 30 MINUTES. 2) DURING SCHEDULED GAMES, THE BATTING CAGE IS RESERVED FOR THE PLAYING TEAMS ONLY! 3) YOUTH UNDER THE AGE OF 13 MUST BE ACCOMPANIED BY AN ADULT. 4) ONLY 2 PEOPLE ARE PERMITTED INSIDE THE CAGE AT ONE TIME: THE BATTER AND PITCHER. 5) ALL BATTERS MUST WEAR A HELMET. 6) ALL PITCHERS MUST USE THE PROTECTIVE PITCHING SCREEN DURING BATTING PRACTICE. 7) ALL USERS OF THE BATTING CAGE UNDERSTAND THEY USE THE FACILITY AT THEIR OWN RISK. 8) NO FOOD OR DRINK PERMITTED IN THE BATTING CAGE OR ON THE SYNTHETIC TURF. 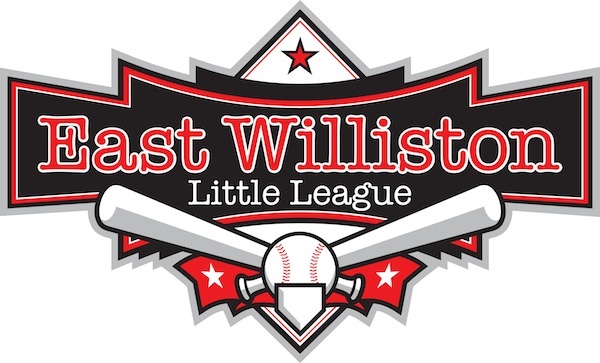 Any child who is a resident inside the boundaries of the East Williston School District, or attends a East Williston district school, is eligible to register for the East Williston Little League as long as they meet the age requirements.